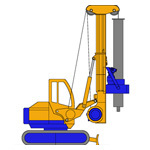 The execution of Piles with Kelly bar is a very versatile system. 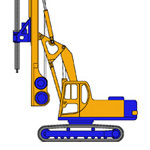 This is the way of execution for the most difficult piles in deep foundations. 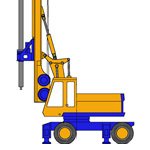 There are many different types of piles that can be installed with a telescopic Kelly bar machine. The drilling tool is installed at the bottom end of Kelly bar, which is made of pipes of diferent diameter forming a telescopic pipe system, in this way very deep hole can be drilled. The execution secuence is the following: Drilling and extraction of all soil leaving an open round hole, installation of steel cage, concreting by direct pouring through tremie pipe. When soil is not stable maybe required to use bentonitic muds or temporary casings.